I cover this in more detail in the goal-setting chapter of my e-book but it’s too helpful of a concept to not share with everyone. seems like it’s never going to happen? While on the other hand, when you’re a little more impartial to something, it seems to come to you with ease? That’s the power of letting go. If you don’t believe that your thoughts have an impact on your life and the outcome of circumstances, then you probably won’t find value in this article. to prove to yourself that it’s not some magical way of thinking, it can all be rainbows and lollipops (but not without effort), you’re gonna love this little tip. It’s a bit of a hard mindset to master. You need to hold on to the belief that your goal is possible and put energy and action into it (wanting it real bad) but at the same time, let go of the outcome (impartial to it). We want to set big goals and envision achieving them (wanting it real bad) but be okay if it doesn’t happen when and how we envision it (impartial to it). I’m a cat person. More specifically a “my cat person” and a “total borderline freak kitten person”. When I see a kitten, I just want to squeeze it and hold onto it and never let it go because I love it so much. But if I actually did that to a kitten, it wouldn’t want to be around me. It would be all…could I get some space please? You’re like totally smothering me! Even though I feel like I’m doing the right thing because everything I do is out of pure, crazy kitten lady love, those actions are actually pushing the kitten away and no toy or treat is going to make it want to come near me out of fear it’s going to get smothered again. The key isn’t to be apathetic about our goals. It’s to be happy with where we are. The problem with setting big goals and being so attached to them is we set our expectations high and then feel crushed when we don’t hit it out of the ballpark on the first try. We want that big goal so badly, we won’t be happy until we get it. But being happy with your current situation is the key to letting go and attracting your goal faster. If you set a goal of getting 100 sales you need to be just as ecstatic over one sale as you would be if you hit 100. If you’re not grateful for what the Universe (or God or whichever higher power you believe in) gives you, why would it give you more? Imagine you get someone a gift for their birthday. You know they’ve wanted it for a while and you’re really excited to give it to them. But it had to be custom made to fit them perfectly so you couldn’t just pick it up off the shelf. You’ve placed the order and it’s on the way. you’ve secretly ordered and they won’t be happy until they get it. You give them the small gift. They open it and toss it aside. No excitement, no “thank you”, no smile and no acknowledgment that it’s a really nice gift, even though it’s not exactly what they wanted. After the reaction to your first gift, how likely are you to give them a second gift? I get upset if someone doesn’t say “thank you” when I hold the door open. There’s no way I’d continue to shower someone with gifts if they couldn’t thank me for going out of my way to pick something out and spend my money on them. Keep this analogy in mind when it comes to your goals. You’ve placed your order with the Universe (100 sales) but it’s tailored to you so it’s not just going to show up overnight. The Universe wants to let you know that they’ve received your request and those sales are on their way so they send you a couple sales in the meantime. Be excited. Be grateful. Know that there are more on the way and let go of when and how they’re going to happen. If you toss those couple sales aside because they’re not 100, you’ll have a hard time getting any more. You’ve heard it before but this goes beyond just setting S.M.A.R.T goals. You need to be able to picture it. 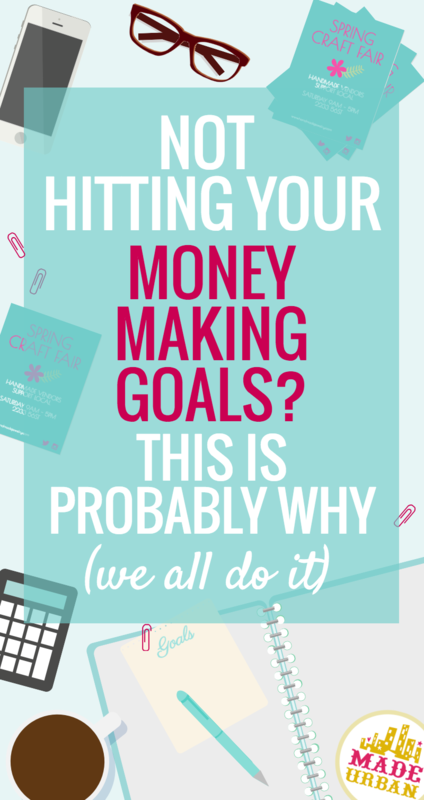 If you have a goal of working from home but you can’t even imagine what that looks like because you’re currently so stressed about paying the bills, you don’t have a space to work in and you don’t know the numbers your business needs to produce in order to quit your full-time job, you’re not going to know whether you’re on the right path or not. Don’t take on too many goals at once. I usually like to focus on 1 business goal and 1 personal goal at a time. That time frame is usually anywhere from 30 days (long enough to build up a habit and see results) to 90 days (short enough that the end is in view and not just a pie in the sky). Focusing on too many goals or projects at once leads to being scattered, overwhelmed and losing precious time by constantly switching your focus. Todd from The 90 Day Year shares more on this concept in his free videos and course. The free vids only come out before the course is ready to be re-released but I do recommend signing up to be notified of them (you can do so here: http://toddherman.me/90DYwaitlist/). There’s a lot of value in the free content alone. One of my favorite sayings that has always stuck with me is a play on the common phrase “I’ll believe it when I see it”. If you want to see results, you need to “Believe it before you see it”. Do you really believe you can achieve that goal or is it something you would love to have but don’t really think it can happen to you. Only you know the answer to that and it takes some quiet time and soul searching to determine if, deep down, you believe in yourself. If you feel a little doubt when you state a goal in present terms (i.e. I love my job and work from home full time) then just start reflecting. I knew there was self doubt with a couple of my big goals when I felt a little drop in my stomach after telling myself it was happening. If you feel that too, just start asking yourself questions and answering honestly. Simply asking “why?” can dig up a lot of answers and uncover a lot of deep-rooted beliefs. Quit searching for those 100 sales in a day or huge spikes in traffic or overnight success. Those are not the norm and you’ll usually find when someone is an “overnight success” they’ve had several failed business attempts and put in tons of work to get where they are. But we only hear about the tip of the iceberg, not what’s underneath and took years to build. What should you do instead? Look for any reason to be happy in a day. I’m talking little reasons. A cup of coffee, the sun shining, planning a yummy lunch or spending 5 minutes each hour getting outside or talking to a friend. They may only give you a few minutes of joy in the day but add them up and you’ll find yourself spending more and more of the day being happy. Happiness is what we’re all after right? Who cares if you’re getting it from coffee or from sales? When you’re clear on what you want, and you’re in the happiness zone, good things start coming to you from across the board. I can’t tell you how many times I’ve become demotivated during a slow phase and began my procrastination routine. I usually use slow times to brainstorm which leads to multiple ideas for speeding things back up, which eventually leads to analysis paralysis; not taking any action because I’m overwhelmed with options, analyzing them and trying to decide what to work on first. As soon as I stop procrastinating and just take action, I see results. They may not be directly related to the area I’m working on but I always take a small improvement/response/result in any area of my business as a sign that I’m doing the right thing. A task is never as bad as we make it out to be in our heads. So just start. Take the smallest step and cross off the first tiny task on the to-do list. You’ll feel better once you start. Don’t get distracted with the next best thing or genius idea. I know you’re creative and have a million ideas of what you could do and where you could go with your business. This is probably one of the biggest obstacles to overcome when running your own business. You don’t have a roadmap or clear steps to take to success so you’re forced to think outside the box and brainstorm different ideas. Choose one of your best ideas, make a detailed plan on how you can execute it, set a time frame and commit to giving it your all until you reach it, make enough progress that it’s self-propelling (doesn’t require your undivided attention) or reach the end of your deadline and decide to change directions.